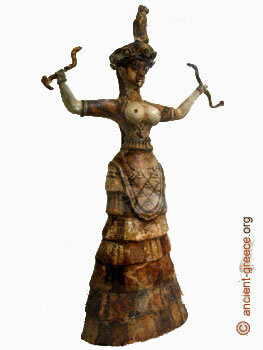 Minoan costume modeled on a doll. The statuette appears to be a goddess or high priestess, and the dress which covers the body all the way to the ground while leaving the breasts exposed was typical of Minoan women attire. the skirt as a belt. 2. Even a Minoan woman’s breasts bounced with physical activity, we may say especially a Minoan woman’s judging from their depicted… cup sizes. A Minoan woman was a working woman, since the men were busy trading and raiding, Viking style. I feel it is very improbable that they would not hold the bouncy parts tight so that they can perform their daily function. 3. Most of the depictions are of tunics which were to be closed by buttons. Indeed we found many buttons on Minoan sites. It is very probable that the women could close their bodices and normally would hold them closed – this is basically for feeding the babies and maybe for sacred dances. Maybe priestesses would have held those bodices open for ceremonies. 4. As far as we know, even though they had reputation of great healers, they were nowhere near having antibiotics. Without antibiotics, any small wound may prove fatal. The image of naked women or men seems totally illogical – you are working with dirt, you SHOULD protect yourself from such potentially fatal accidents. Hot weather or not.